Q&A: Use of the sacred circuit glyphs in helping someone with schizoaffective disorder. Questions about enhanced ability to receive contact from extraterrestrial consciousness, including hybrid children. Further discussion of the use of the sacred circuit glyphs in helping with the various issues we wish to change. Questioner wants Bashar to share with us more of the sacred circuit glyphs than were given in the handout. Do we have our own personal sacred circuit symbols? How can we be more sensitive to our highest excitement? Do the sacred circuit symbols resemble Native American pictographs and Tibetan designs? Details about the lift of the quarantine in 2012. Discussion of planet 's vortices and the effect of using the sacred circuit symbols to enhance perception of them. How does the higher-mind/brain/physical-mind system relate to Jesus ' statement that the Kingdom of Heaven is within? Discussion of the change of energy on Earth after 2012. What can be done to steer children away from violent games to positive activities? Can use of the sacred circuit glyphs help a person get off medications? Discussion of ¨stuck energy ¨inhibiting out-of-body experiences. Details about ¨windows of opportunity ¨and their closing. Does the water in the brain also change when we use the sacred circuit symbols? Details about the realignment of the circuits of the brain with the energy of unconditional love. What is the frequency of the energy of unconditional love? Can the sacred circuit symbols be translated into tonal vibrations? Sharing and discussion of knowing ¨the answers ¨on one 's own. Details of the ¨size of the weave ¨of spirit reality: the Planck length. Question about a mathematical expression of one of the sacred circuit symbols. How does one distinguish what is mere fancy of imagination from what has actually occurred? Discussion of how the movie ¨Paranormal Activity ¨triggered in the questioner intense fear of being alone at night. Why did the sacred circuit symbol labeled ¨Act ¨really stand out to the questioner? What do the circuits in the brain take their cues from? Does the processing of beliefs always have to be a cognitive process? Discussion of the best way to allow oneself to shift realities so there is a break in continuity. Further details on the use of the sacred circuit symbols. Discussion of the meaning of ¨Circumstances don 't matter; only your state of being matters. ¨Is it possible to get off ¨your path? ¨Does acting on your highest excitement always point you toward your windows of opportunity? How can we distinguish between following our excitement and immediate gratification? Questioner wants to know why she notices the same numbers showing up in her life every day, several times a day..Does the universe expand to infinite perspective or are there several universes? Were such teachers as Jesus, Buddha, Krishna, etc. extraterrestrial beings, or hybridized humans? Does Bashar accept human volunteers to travel to his world? Discussion of examples of not viewing one 's reality holistically. 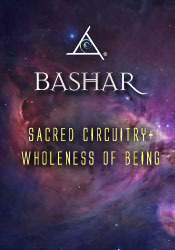 Bashar gives the ingredients of what he identifies as a potential ¨cancer cure. ¨Discussion of allowing all choices to be equal without preconceived ideas so as to allow the joy of any choice to reveal itself. Clarification of what is meant by the phrase ¨you co-create your reality with others. ¨Examination of ¨fault ¨and ¨victimhood. ¨Does Bashar 's civilization have more synchronicity than ours? Discussion of evolution of our respective societies. Is there, amongst all souls in creation, a general purpose? Will there come a time when most humans believe in reincarnation? Does Bashar 's people lie? What is Bashar 's definition of ¨lie? ¨Are there people on Bashar 's planet that Bashar dislikes? Why don 't Bashar 's people lie on their planet? What is the nature of the connection between the magnetic field of the heart and the magnetic field of the Earth? How do Bashar 's people interact with the plants on his world? When will be the next visit of the Shalinaya?